When I drive to a nearby city in North Carolina, I usually take the back roads, rather than the highway. When I go this way, I drive past a church with a cemetery right beside it. As I drive past, my eye is always drawn to a beautiful headstone. I pulled over on the side of the road one day to see who this headstone honors. It is for a little boy who passed away very early in life. The stone is very unique, in the shape of a train... little boys love trains. Not only is the stone itself so beautiful, but each time I pass, his spot is decorated. For all different seasons, holidays, and for his birthday. Though I have no idea the story of this little boy or who his family is, I can tell how much he is loved by the care that goes into his spot. By the special decorations left that bring color to this cemetery. By the design of his stone. He is so loved and missed. I can tell this about complete strangers. And it got me thinking... I wonder who sees Lily's special spot. I wonder what people think of her stone when they see it. I hope they think the same thing about her stone and spot as I think about this little boys'... that she is so very loved and missed. That her stone is beautiful. That the decorations are sweet. 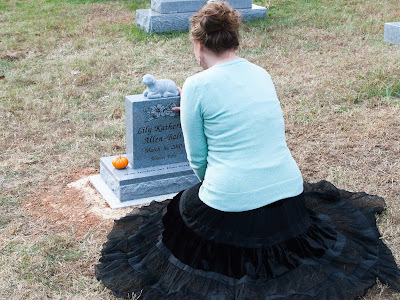 That even though they don't know her story or who I am, they can just feel the love... the love I have for my precious daughter who I can only mother through things like designing her headstone and tending to that special spot. "A Bump in Life" Book Giveaway!